116 = 22 x 29. 116! + 1 is a prime number. 116 has a representation as a sum of two squares: 116 = 42 + 102. 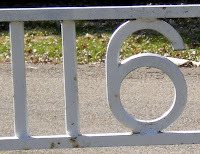 116 is a composite number that when added to the sum of its prime factors becomes prime: 116 + 2 + 2 + 29 = 149. The Hundred Years' War between France and England lasted 116 years, with periodic truces, from 1337 to 1453. I would have contacted you via e-mail but I can't find any contact info on your blog. I am the owner of http://aboutanumber.com a site dedicated to numbers 1 - 100,000. Aboutanumber.com provides interesting and relevant information about the numbers we cover. I was wondering if you would be interested in a link exchange. Every day when you post a new number of the day, you would link to our webpage for that number (i.e. http://aboutanumber.com/2345) if 2345 was the number of the day and in return we will link to your blog post from that page thereby helping both of us.